I have prepared a number of "eBooks" (electronic books) on a variety of piano tuning related subjects. These may be downloaded to your computer and read off line. You may also print them out if you would like a hard copy. Printed copies are also available which can be mailed to you. The printed copy is not a bound book but only a loose-leaf print-out of the digital version. Click on an image for more information . . .
Did you ever wish that you could tune your own piano? Well . . . here is what you need to get started. 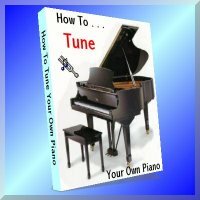 Download my manual today & discover the basics of How to Tune Your Own Piano. FREE consultation is available with your purchase. More information please . . .! Do you have basic mechanical skills? Then doing your own repairs will be a cinch! Once you understand the functions of the various parts of a piano, you can easily do most of the repairs yourself. My eBook will teach you how to diagnose a problem & then make the appropriate repairs. I also give you sources for all the tools & parts that you may require. Click here for a detailed contents description. Advance to the next level & discover how to rebuild your own piano. If you are comfortable with doing minor repairs, then you can certainly move up to major rebuilding work with little difficulty. This manual gives you detailed directions for installing all new parts -- strings, hammers, felts, etc. More information is available here . . .
Not happy with the tone or tuning stability of your piano? Maybe you need to re-design the stringing scale. Especially if you are re-stringing, it is a good practice to do some calculations in order to determine if you can make any improvements in the string diameters used. This program will enable you to do all the calculations for each note in seconds instead of hours! More information & some screen shots can be viewed here. Don't mind getting your hands dirty? As long as you have a suitable place to work, such as your garage, you can SAVE a bundle by doing the refinishing yourself. This manual is primarily written for those who have had no previous experience in wood finishing. The basic steps of stripping off the old finish, sanding, staining & applying your finishing coat are all covered in an easy-to-understand manner. A more detailed description of the contents of this manual is found here. Are you just starting out in your new tuning career? Or, maybe you are an experienced technician who would like to grow your business. Then this manual is for you! 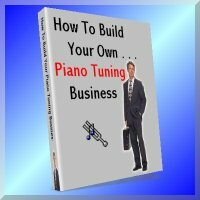 I have endeavored to keep this manual simple & practical so that you can operate an efficient piano tuning business in the most profitable manner. You can learn more about the contents of this manual by clicking on this link now. Do you like working with new wood? If you have a basic wood-working shop, you can easily build your own bench. 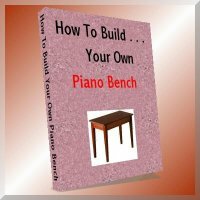 These plans are my own special design enabling you to build a sturdy, long-lasting bench. Pictures & a fuller description can be viewed here. 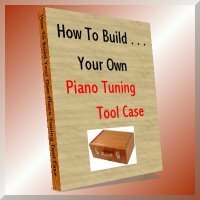 You will just love this piano tuning tool case! I designed this tool case for my own use & thought that I would share it with you. This sure beats carrying your tools in a tackle box! "Why Does My Piano Go Out of Tune?" "How To Shop For A Good Piano"
"Is My Old Piano Worth Rebuilding?" "Should I Move My Own Piano?" "How To Clean Ivory Keys"